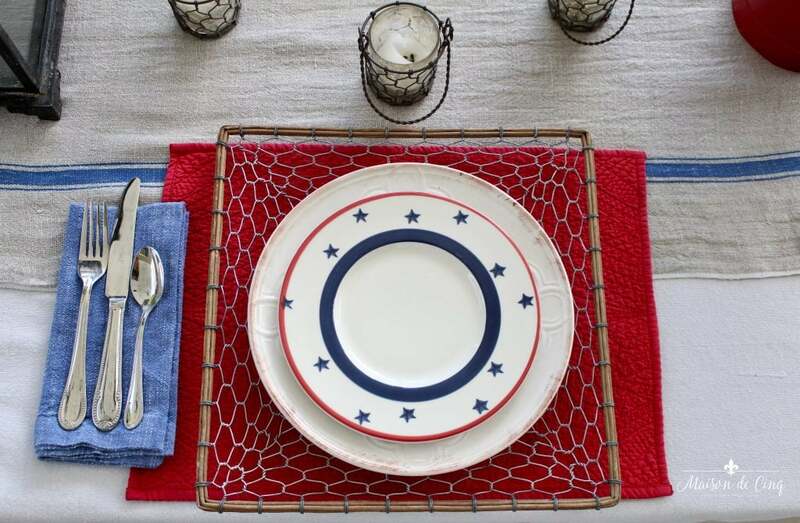 When I posted my Memorial Day table last month I had mentioned that I would like to try something a little different for my Independence Day tablescape. Though I did end up changing it up a little more than I planned (I didn’t want to bore everyone)! 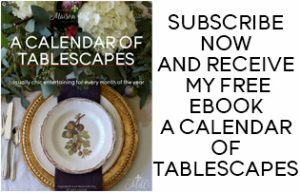 If you love tablescapes as much as I do and are looking for more inspiration, check out my free e-book featuring twelve of my favorites! I don’t usually go too crazy with the “theme” stuff because I think it can get a little overwhelming. 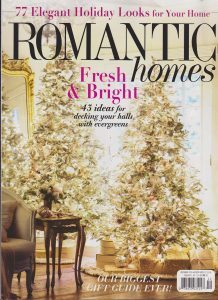 I like it to feel fresh and patriotic, while still being uncluttered. 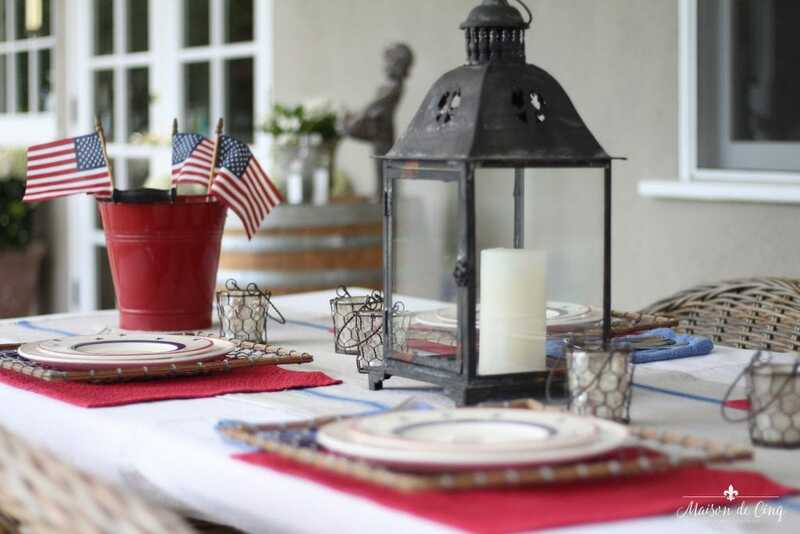 Here’s my version of a simple Independence Day tablescape…. I didn’t do a traditional floral centerpiece because I wanted it to feel rustic and casual. So I just used my iron lantern in the center, and flanked it with the chicken wire votives. 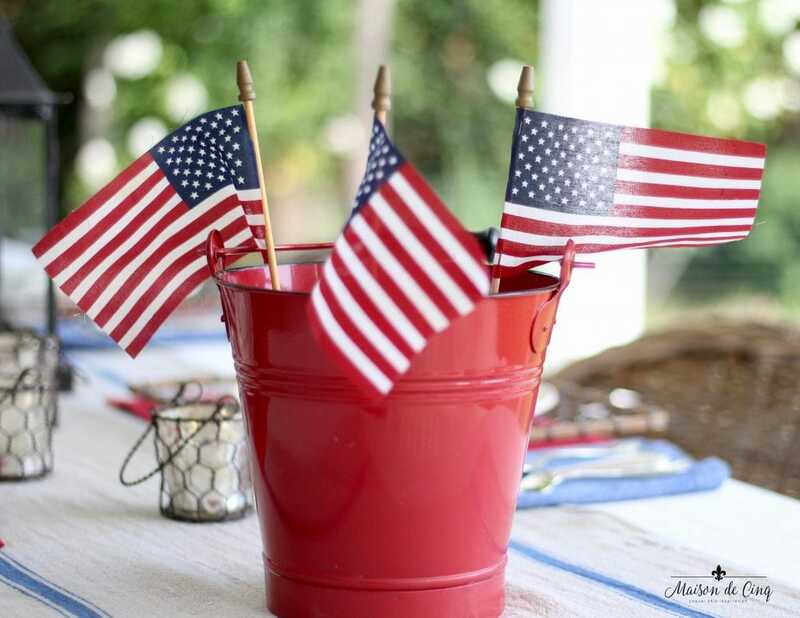 And of course, since it’s the Fourth of July, you have to have flags! 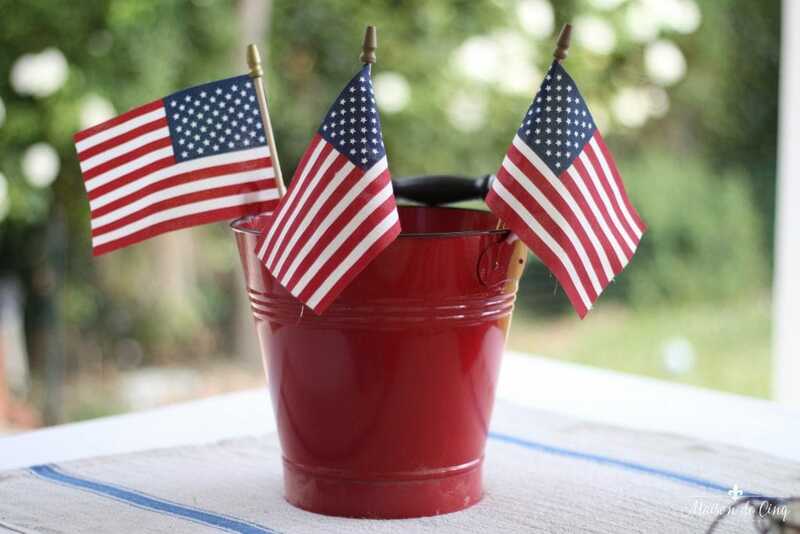 I filled some red buckets with sand and stuck the flags in those. So simple and easy! And I like the way it turned out. The adorable star plates are from Home Goods and were the only new thing I bought (similar – and so cute! – here). I just thought they were so cute and would be perfect for the Fourth, I couldn’t resist! 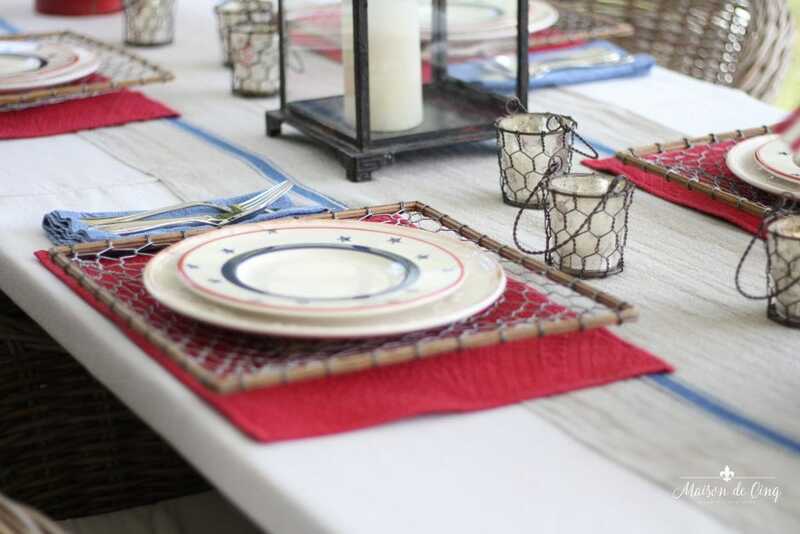 I layered them over my usual white dinner plates (similar here), and re-used my chicken wire chargers. I’m in love with this runner! When I couldn’t find more antique grainsack runners, I was looking all over the internet for a reproduction that was a good one (easier said than done!) I finally found this one at Sundance Catalog and I can’t believe the quality! It is super heavy linen (just like the antique ones) and it washes well and gets softer over time. I liked it so much I ended up buying it in both the red and the blue. 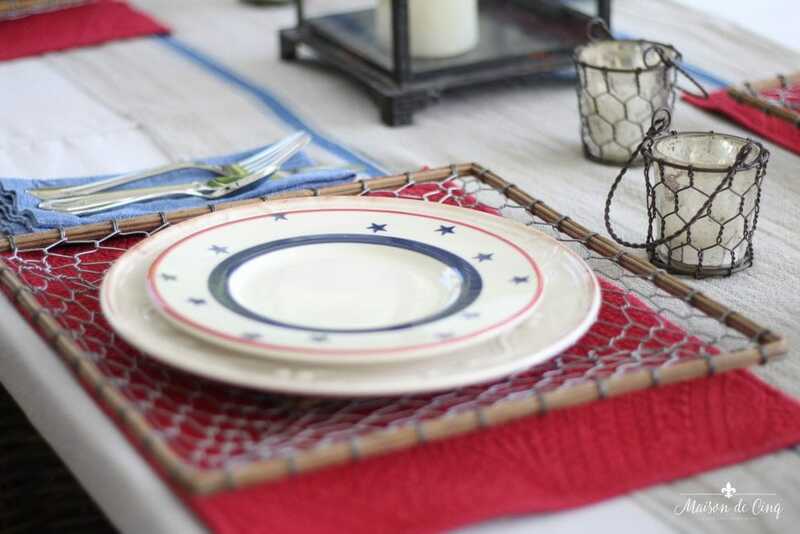 Red placemats and blue napkins are simple but continue the simple red, white and blue theme. 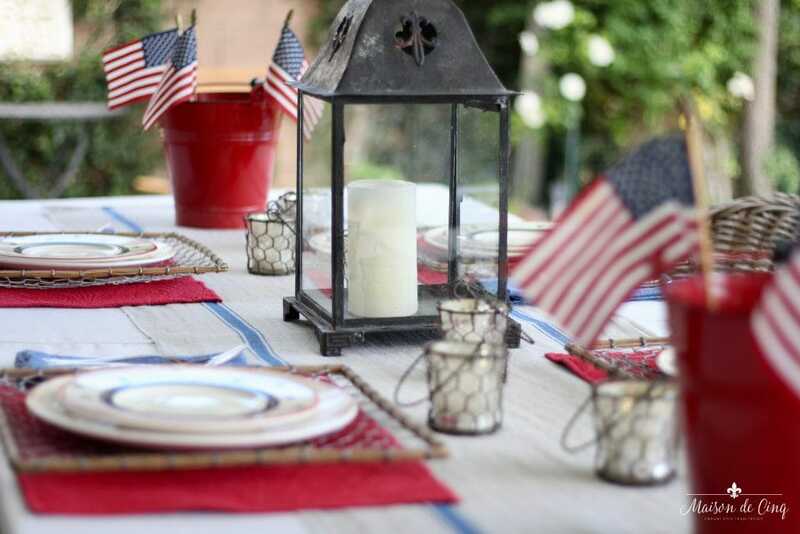 Hopefully I’ve inspired you to try your own Independence Day tablescape! 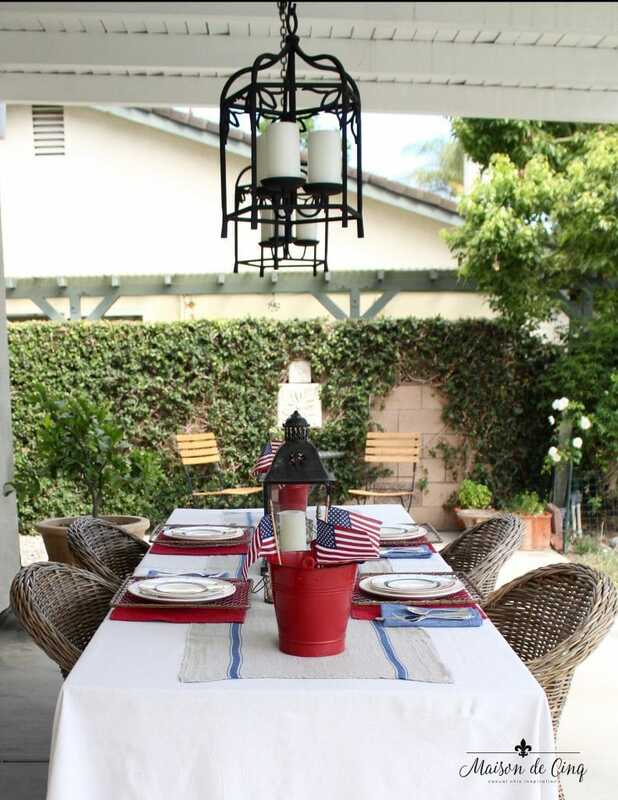 By using what you already have, and adding just a few simple decorative items (like the buckets and flags here), I think you can put together a table that is fun and festive, but easy too! 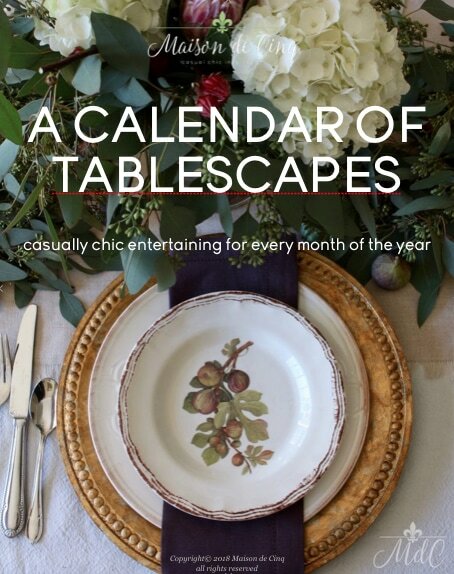 And don’t forget to sign up for my emails and get your free e-book, A Calendar of Tablescapes! Great table! So enjoy seeing what great idea’s you always have! BTW… where did you find those amazing chargers.. the add so much texture and Fun! Hi Janet – thanks so much for your kindness! And the chargers were Pottery Barn a few years ago. You can sometimes search and find them on ebay. Hope that helps! Thanks Shelley! Hope you have a wonderful Fourth too! Thank you so much Lori, you are so sweet! And I truly appreciate you taking the time to leave such nice feedback! Glad that you decided to stop by! And wishing you a very happy Fourth! Love the lantern and all the textures. 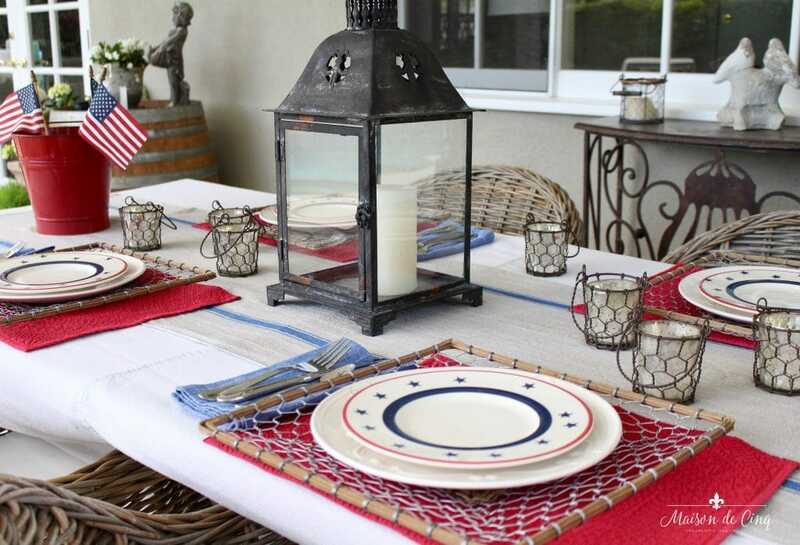 The red, white and blue looks great out on your patio! Happy 4th to you! I have never seen wire chargers like this before, they look really good and I like them a lot, so much so I am thinking of getting some, but I do wonder what the locals here in France would think, would they think they were a great design piece or would they think I had grabbed some of the chicken fencing and tried to be clever!!! 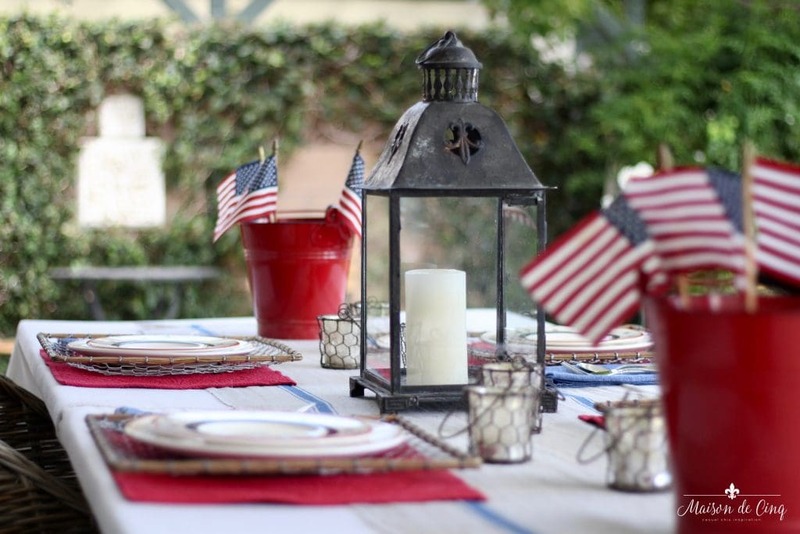 This is a wonderful example of the perfect décor for a real-life patriotic celebratory meal. Just the right amount of colour, texture and décor items. 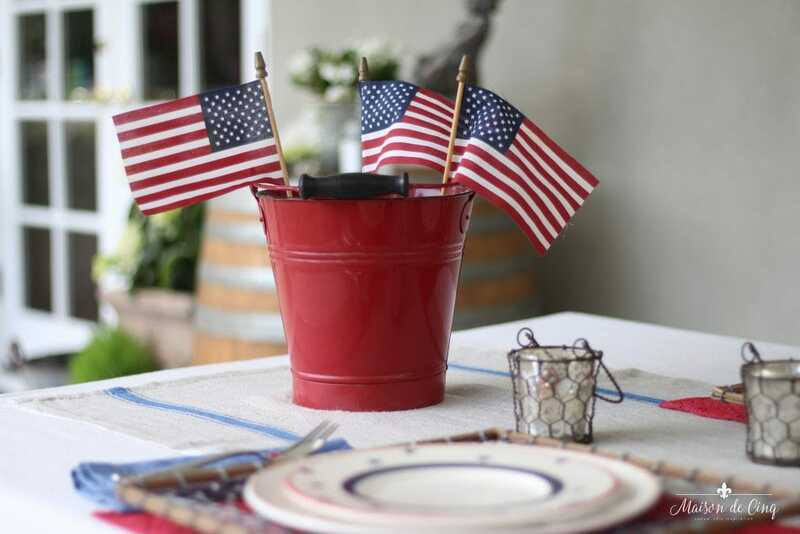 The red pails with the flags are terrific and your place settings with the fantastic wire-type chargers look great. 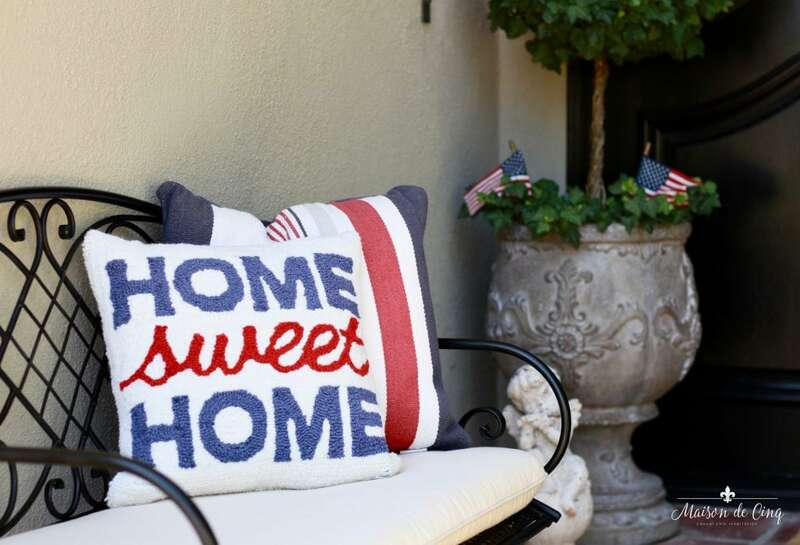 Wishing you a fun time on the 4th!